St. Vincent and The Grenadines lie at the southern end of the eastern border of the Caribbean Sea where it meets the Atlantic Ocean. The country consists of the main island of St. Vincent and the northern two-thirds of the Grenadines. It is south of St. Lucia and west of Barbados. The island of St. Vincent is volcanic and includes little level ground. The windward side is very rocky and steep, while the leeward side has more sandy beaches and bays. Because of its topography, St. Vincent has a tropical rainforest full of eco-adventures, idyllic beaches, coral reefs and turquoise lagoons. It is a tropical paradise for yachting, scuba diving, enjoying nature, and relaxing in luxurious hideaways. Couples choosing St. Vincent for their Caribbean wedding will find powder white sands and a backdrop of blue skies and swaying coconut palms. Lying just a few miles south of St. Vincent is Bequia, a charming sleepy port of call with shops featuring the works of model shipbuilders. Also a few miles away is Mustique, a hideaway for the rich and famous. And for those seeking total seclusion, Palm island and Petit St. Vincent await. For adventure, there is diving in the deep waters surrounding the island, fishing in its abundant waters, or trying the zip-lines suspended high above a private forest reserve soaring between 200 year old mango and mahagony trees. Plenty to do for guests attending a Caribbean wedding on this unique island. Guests attending your Saint Vincent wedding will find gourmet dining as well as local restaurants offering West Indian and Caribbean cuisine. Nightlife consists of a few clubs and discos offering West Indian entertainment, and a casino. Some of the hotels offer dining, dancing, steel band and Calypso music. 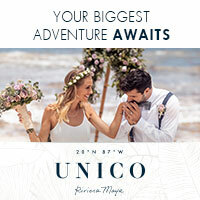 Your St. Vincent wedding will exceed your expectations with the assistance of our Caribbean Wedding Specialists who are standing by to help you plan everything from your accommodations to your wedding ceremony to your dazzling reception. We can also help arrange activities for you and your guests who join you for your Caribbean wedding on St. Vincent and the Grenadines.